CerAnode-Rod-Assemblies (CRA) are high quality mixed metal oxide anodes manufactured with special factory connections. They are extremely rugged and powerful making them an ideal choice for a variety of cathodic protection applications. This anode will support the evolution of both oxygen and chlorine making it the choice for fresh water, seawater, mud, brackish water and coke environments. 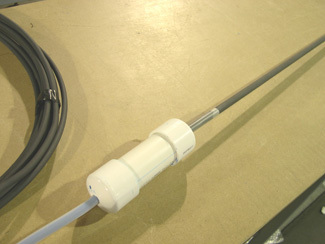 CerAnode’s unique cable-to-anode connection results in a very high quality, high reliability anode assembly. Perforated Pipe Protective Housing Option is ideal for applications where protection of the anode element or electronic isolation from surrounding structures is desired. Materials are chosen to be compatible with the electrolyte environment as requested. Many rod diameter choices available.